India was not the only civilization to have a place value number system. Babylon and China did too. But India revolutionized numbers by adding the second piece of the jigsaw: the number zero. Place value systems require a strategy to describe the case when there is nothing in a position. The Babylonians used a marker to represent nothing; the Chinese used a space to represent nothing. Only the Indians introduced a symbol, 0, and treated it as if it was a normal digit just like all the others from 1 to 9. Invention of the number zero was possibly the greatest conceptual leap in the history of mathematics. But why did the Indians make this leap and not China or Babylon? My trip to India, for a BBC radio documentary, was to investigate why this was the case. India made another contribution to world culture as well as zero: the idea of nirvana, the transcendent state of “nothingness”, when you are liberated from suffering and desires. In fact, the word used in philosophical texts to mean nothing, or the void, is “shunya”, the same word later used to mean zero. In the modern world it is common to see religion and science as always in conflict. Yet in ancient India, one cannot untangle mathematics and mysticism. You can listen to Alex Bellos’ full 28 minute radio documentary on the topic at the BBC website. Stone Age Cinema: Cave Art Animations? Indians were not the only one who came up with the concept of zero. 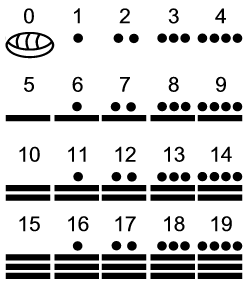 The Mayas also used it in their 20-based numerical system since 36 B.C. “Maybe”?? ??? Uh-huh . .suuure. 2012 turned out to be nothing; maybe that was the point! I see the article as being about what role spirituality played in the formation and usage of zero. I’m not getting your point. In fact, the who is all the peoples mentioned in this thread. BTW How do you back your claim that 2012 turned out to be nothing? I have it on good authority that around 60 million people died in 2012. So there.